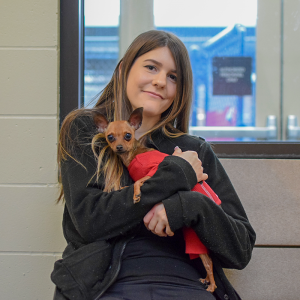 A tiny three-year-old Chihuahua set a milestone for the Oregon Humane Society today by becoming the 11,000th pet adopted in 2018. Nelson is going to a new home with the Grenfell family of North Portland where he will join two cockatiels and a bearded dragon. This is the earliest date that OHS achieved this milestone in the new shelter. This is the ninth year in a row that OHS has reached this milestone, and we are now setting 12,000 adoptions as the year-end goal. Nelson, a dog transported to OHS from California, was in the shelter before the wildfires began and was moved out of the area to free up resources for displaced pets. “Each year, we set a goal of finding homes for 11,000 pets, and it warms my heart to know that we will be exceeding the goal this year. It’s wonderful to see people opening their hearts to shelter animals,” said Sharon Harmon, OHS President and CEO. The large number of adoptions makes OHS one of the busiest shelters in the nation. OHS adopts more animals from its shelter on NE Columbia Blvd. than any other single shelter facility on the West Coast. This feat is especially remarkable because OHS never puts a time limit on how long a pet remains available for adoption and has a save rate that is among the highest in the nation. The Oregon Humane Society is asking the public to open their hearts to the 114 dogs, cats, small animals and two horses who are also looking for a “Home for the Holidays” this December. For every animal in the shelter on December 1, OHS seeks to place them in a “Home for the Holidays” by December 31. Some of these pets have been awaiting adoption for just a few days; others have been waiting for weeks. View all of our available pets here.